All car, truck, RV, marine amplifiers and repeaters listed below are compatible with your Mobilicity service. Mobilicity Vehicle Signal Boosters for cars, trucks, RVs, boats and other vehicles. When you are on the road, you will experience fluctuating signal strengths. Despite the consistent coverage and availability of Mobilicity across major cities in Canada such as Toronto, Ottawa, Calgary, Edmonton and Vancouver along with more than 95% of the rest of the landmass, you may get very weak signals at certain places. When you're driving, you must consider using a Mobilicity signal booster for car. While it is not wise to talk and drive or even checking your phone for texts and mails, getting the requisite network or signal strength is imperative. You don't want to be in a blackout or dead-zone to be unreachable by the world or more importantly, not be able to reach the world in case of an emergency. When you consider getting a Mobilicity signal booster for car, you must factor in the variants. You must pick the one that suits your needs. Cars come in myriad sizes, from compact hatchbacks to sedans, sport utility vehicles to recreational vehicles. The size of your car, where you are, or what kind of terrain and routes you traverse, along with the factor of how many people you typically travel with, will all determine an exact Mobilicity signal booster for car that shall be relevant to your needs. There are two types of Mobilicity signal booster for car. There are single user cradle boosters and multi user wireless boosters. In both categories, there are boosters for cars, trucks, recreational vehicles and marine. Single user cradle signal boosters for Mobilicity cell phones in car or truck. • weBoost Drive 3G-S (470106) Cradle Booster Kit is for a single user accessing 2G Voice or 3G Data networks. This booster works in cars, vans, trucks, SUVs and RVs as well as boats. The booster is capable of increasing the signal strength by as much as 23 dB. The booster can only strengthen the signal or enhance network availability of one phone or device at any given point in time, and the particular phone or device must stay hooked to the cradle to gain the signal strength. This Mobilicity signal booster for car will work with any phone and anywhere. It can improve the quality of voice calls and can enhance the internet speed. While on the go, the battery in your smart phone will take a beating because it consistently searches for better network or signals. This will be averted as the booster will do it for the phone. In effect, your phone battery will last longer than usual which is very essential while on the road. 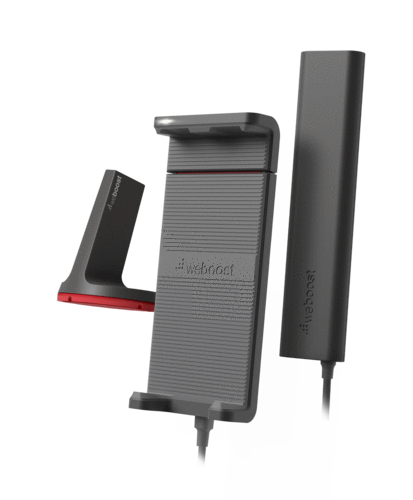 • If you are on 4G network and want the same benefits as that of the WeBoost Drive 3G-S, then you can opt for the weBoost Drive 4G-S (470107) Cradle Booster Kit. Wireless signal boosters for Mobilicity cellular phones to boost signal for multiple users in cars and trucks. • WeBoost Drive 3G-M (470102) Wireless Booster Kit works with 2G Voice and 3G Data networks. It can improve signal strength by as much as 50 dB. It can offer better network availability and signal strength in cars, vans, trucks and even on boats. The booster can be used by multiple phones or data devices at any given time, and there is no requirement of using a cradle. The box comes with the booster, a magnetic antenna and a DC power adaptor. There's a slim low profile antenna as well. A 12.5 feet cable is included to install antenna. This Mobilicity signal booster for car can enhance network availability to an extent that you can enjoy seamless video calls without any hiccups or glitches. 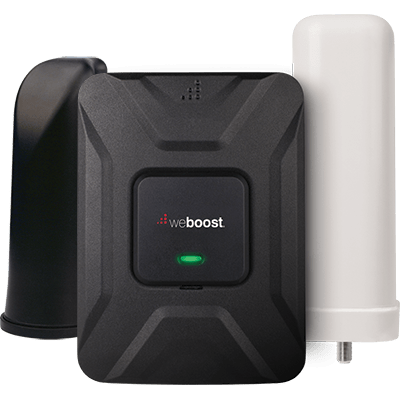 • If you are on 4G network, then you can choose the weBoost Drive 4G-M (470108) Wireless Booster Kit which offers the same benefits as the 3G variant with 4G compatibility. • weBoost Drive 3G-X (470111) is the most powerful 3G wireless booster kit available that works with 2G Voice and 3G Data networks. Capable of increasing signal strength to up to 50 dB, this is one of the more powerful signal boosters available right now for multiple users in a car. The signal boost offered by this device is as much as 60% stronger than similar boosters available in the market. The six feet radius of this Mobilicity signal booster for car also ensures that everyone in the car can receive uniform coverage and thus the same level of boost. Many wireless boosters for car have fluctuating coverage, even if it is a compact hatchback. The Drive 3G-X is great for those who are on the road all the time, primarily for work. • WeBoost Drive 3G-X NMO Antenna (470411) Booster Kit comes with an antenna that must be drilled and not magnetically mounted. It is compatible with 2G Voice and 3G Data speeds. This Mobilicity signal booster for car is ideal for recreational vehicles and trucks. Large vehicles don't benefit from small boosters that can at best cover two or three feet of linear distance. Bigger vehicles require more powerful boosters that can cover the length and breadth of the car so everyone in every accessible part of the vehicle can get equal advantage of receiving the increased signal strength. The Drive 3G-X NMO Antenna is capable of increasing the signal strength by as much as 50 dB. There is no cradle and multiple phones can be hooked at the same time, thus benefiting from the increased signal strength. The booster offers a six feet radius of maximum boosted signal strength and even beyond this coverage area, one would get substantially increased signal strength. Strategic installation of this booster can ensure that the entire vehicle gets generously boosted signal strength. RV signal boosters for Mobilicity wireless phones to boost signal for multiple users in recreational vehicles, motor homes, and trailers. 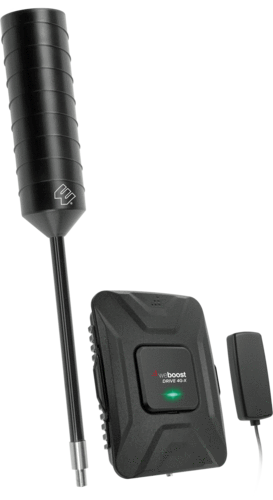 WeBoost RV 4G (470201) Signal Booster Kit For RV is compatible with 2G Voice, 3G Voice & Data and 4G LTE Voice & Data. The range of this booster is about 1,500 square feet and it can increase the signal strength by as much as 60 dB when the signal outside is strong. With medium outside signals, the coverage area would be 1,000 square feet. Even 150 square feet which is the coverage area when outside signal strength is very weak, would be good enough for a recreational vehicle. Marine signal boosters for Mobilicity mobile phones to boost signal for multiple users in boats, ships, and yachts. WeBoost Drive 3G-XM (470311) Marine Booster Kit is for boats, marine vessels and ships. The booster is compatible with 2G Voice and 3G Data transfers. It can improve signal strength by as much as 50 dB and multiple users can have real time simultaneous access to the booster. A typical Mobilicity signal booster for car may not always be as effective on boats and ships, or even when people are getting ferried across a lake or river. That is where this booster becomes relevant. With six feet radius for maximum and most potent coverage, and a further coverage with relatively weaker boosts, the Drive 3G-XM is a potential choice if you own a boat and for marine operations. All these signal boosters work perfectly with Mobilicity network. Whether it is 2G or 3G or 4G LTE Advanced, or whichever phone and plan you have from Mobilicity, you can get better and stronger signal or network availability with any of these boosters. Depending on your needs, how often you travel and how, with how many people and what routes you take, you can choose the ideal Mobilicity signal booster for car. Consider opting for a booster that offers more than what you imperatively need.